With the emergence of cognitive sensor networks, and notably the Internet of Things, the passive UHF RFID (Ultra-High Frequency Radiofrequency IDentification) technology is evolving with new functionalities and new types of applications outstripping typical logistics, security and traceability applications. Always benefiting of unitary identification, new types of tags are emerging, so-called augmented tags, because they become sensor-tags with new capabilities as environment sensibility, cognitive behavior, data processing, communication between tags, etc. In this context, the PhD thesis objective is to propose original strategies in order to ensure the communication between two future augmented tags. Recent works demonstrated the sensor-tag concept with tags enable to sense temperature, humidity, crack, vibration, gas, etc. Furthermore, several prototypes of augmented tags have also been proposed integrating until to three sensors, sometimes an actuator, private or shared memory, and microcontroller [1-4]. Otherwise and in parallel, the tag-to-tag communication concept has been introduced also allowing new functionalities, but also requiring additional energy sources (ambient or dedicate ones) especially when the distance between tags is higher than some centimeters [5-6]. Reversely, depending on the application, this very short-range behavior could be used to increase security or ID pairing. More widely, the concept of scatter radio is a hot topic because of its ability to establish communications without emitting any additional radiowaves in the environment. The combination of these two approaches open the way for multiple perspectives but one of main challenges will be to conserve the passive characteristic of tags. In this context, the objective of the proposed project focuses on the proposition of strategies and methods in order to optimize the tag-to-tag communication depending on the target application. Particularly, the studied scenarios will be discussed in the framework of the Spie ICS – INSA Lyon chair on IoT. It is worth noting that the solutions must consider the EPC Gen 2 standard in order to accelerate their eventual deployment in industrial fields. The expected contributions cover theoretical concepts until experimental aspects associating new strategies, new tag capabilities, new data communication protocols, etc. Master in Electrical Engineering or Telecommunication Engineering with excellent skills in microwave, RF systems, and applied signal processing and strong interest for the proposed topic. Good English language skills are also required. Expert in microwave, specifically in RFID and sensor network, distributed optimization, with strong experience in: modeling, simulation and design of RF circuits / components; software such as ADS, CST, HFSS, Matlab; RF measurement. This PhD thesis will be fully funding by the Spie ICS – INSA Lyon chair on IoT (http://www.citi-lab.fr/chairs/iot-chair/). The PhD candidate will be hosted in the CITI Lab (http://www.citi-lab.fr/), a research lab associated to INSA Lyon (http://www.insa-lyon.fr) and Inria (http://www.inria.fr). S. Kim, C. Mariotti, F. alimenti, P. Mezzanote, A. Georgiadis, A. Collado, L. Roselli, M.M. Tentzeris, “No battery required: perpetual RFID-enabled wireless sensors for cognitive intelligence applications,” IEEE Microwave Magazine, vol. 14, no. 5, pp. 66-77, July-August 2013. B.S. Cook, R. Vyas, S. Kim, T.Thai, T. Le, A. Traille, H. Aubert, M.M. Tentzeris, “RFID-based sensors for zero-power autonomous wireless sensor networks,” IEEE Sensors Journal, vol. 14, no. 8, pp. 2431-2419, August 2014. C. Occhiuzzi, G. Marrocco, “Constrained-design of passive RFID sensor antennas,” IEEE Transactions on Antennas and Propagation, vol. 61, no. 6, pp. 2972-2980, June 2013. R. Colella, L. Tarricone, L. Catarinucci, “SPARTACUS: self-powered augmented RFID tag for autonomous computing and ubiquitous sensing,” IEEE Transactions on Antennas and Propagation, vol. 63, no. 5, pp. 2272-2281, May 2015. P.V. Nikitin, S. Ramamurthy, R. Martinez, K.V.S. Rao, “Passive tag-to-tag communication,” in Proc. IEEE International Conference on RFID, Orlando, US, April 2012. L. Zhou, F. Hutu, G. Villemaud, Y. Duroc, “Simulation framework for performance evaluation of passive RFID tag-to-tag communication,” European Conference on Antennas and Propagation, France, April 19-24, 2017. 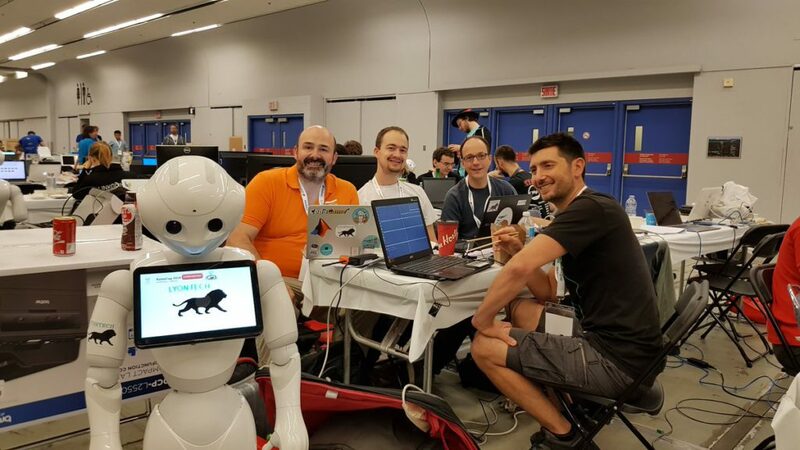 The LyonTech team ranked 5th among 12 teams at the RoboCup@home 2018 (Social Standard Platform League) in Montréal. 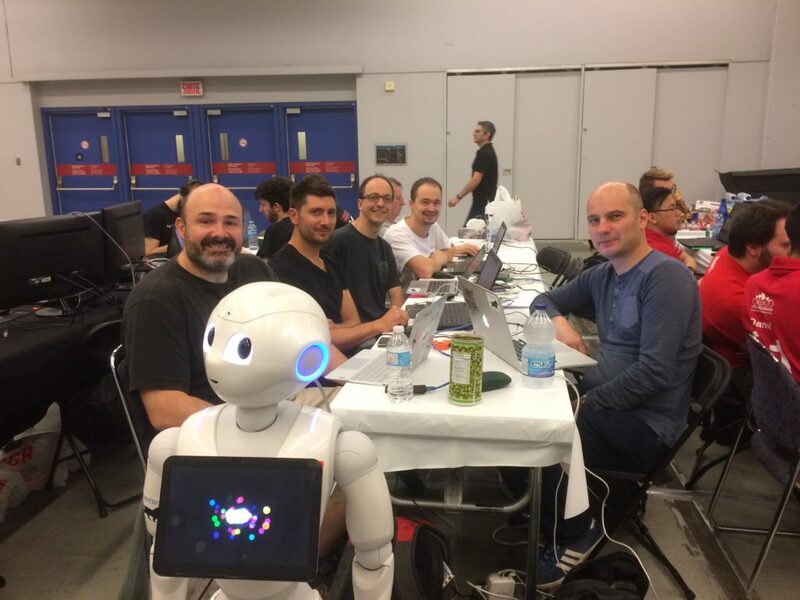 The LyonTech team includes CPE Lyon, INSA Lyon, Université Lyon 1, LIRIS (CNRS), CITI Lab (INRIA). Congrats to our Chroma Team – Jacques Saraydaryan, Fabrice Jumel, Olivier Simonin, Christian Wolf, Laëtitia Matignon! In recent years, the interest in eye detection applications has increased considerably. There are a lot of eye detection methods used in different applications such as neuroscience, psychology, assistive technologies, in order to communicate with disabled patients, computer gaming, monitoring technologies for driver’s fatigue (in commercial and public transport), advertising industry, people identification based on face recognition and eye (iris) detection and in different military applications to help pilots to aim weapons just by looking at a target. A head-mounted eye tracking interface consists of an infrared video camera mounted on a frame glasses right underneath the eye, connected to a PC (or laptop), for eye pupil image acquisition and processing. This device is used to measure the point of gaze or the motion of an eye relative to the head. The presentation will focus on the software component used in eye tracking interfaces for real-time applications, which includes the algorithms for eye image binarization, pupil center detection, system calibration, mapping and ideogram selections. Different types of pupil detection algorithms are comparatively presented: the least squares fitting of ellipse, the RANdom SAmple Consensus (RANSAC) paradigm, the circular/elliptical Hough transform- based approaches, the projection method algorithm, the detection of the maximum dark area centroid in the eye image and the STARBURST algorithm. 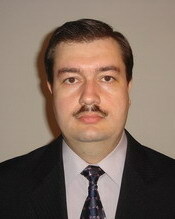 Radu Gabriel Bozomitu received the degree in communications and electronic engineering; the master degree in the field of digital radio-communications; and the Ph.D. degree from the “Gheorghe Asachi” Technical University of Iaşi, Faculty of Electronics, Telecommunications and Information Technology in 1995, 1996 an 2005, respectively. R. G. Bozomitu obtained the PhD advisor position in 2017 and works as professor at the Department of Telecommunications and Information Technologies from Faculty of Electronics, Telecommunications and Information Technology from the “Gheorghe Asachi” Technical University of Iaşi. His present interests are in the areas of radio communications, analog integrated circuit design and assistive technology. Courses taught at “Gheorghe Asachi” Technical University of Iasi: “Radio communications“, “VLSI implementation of the radiofrequency circuits” and “Advanced radio communications”. He has edited or co-authored five books on analog VLSI circuits design, radiocommunications and assistive technology.